Scientific knowledge about physical activity and health is of little value if people cannot understand it and apply it to their lives. For the past three decades, there has been a gradual but steady development in the effort to present information on physical activity and health to the general public. Research has repeatedly shown that exposure to regular, frequent bouts of physical activity stimulates physiological and metabolic changes that benefit health. It is helpful to classify these as either (a) chronic effects, that is, adaptations to training acquired over weeks or months, or (b) short-term, acute responses to each individual session of activity. From the preceding discussion, it is clear that a decrease in physical activity contributes to the increased prevalence of obesity worldwide. While psychological, social, and environmental factors contribute significantly to physical activity behavior, it is important to recognize that activity behavior also has a biological basis and that genetic variation could affect individuals’ propensity to be physically active or sedentary. 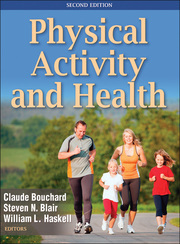 Written by leading scientists from the United States, Canada, Europe, and Australia, Physical Activity and Health, Second Edition, brings together the results of the most important studies on the relationship between physical activity, sedentarism, and various health outcomes.